Yesterday, chef Johnny Gnall highlighted new ways to serve seasonal produce. Today he discusses five more fruits and vegetables, bursting with flavor and waiting for you to pick up a pound or two. If you have questions or suggestions for tips, email Chef Johnny. Some people can get weird about okra, and with good reason. If cooked improperly (which, it appears, is quite often), it can get slimy. No one over the age of five wants to eat slime, so okra tends to get avoided or neglected. This is a shame, as it good okra is…very good, and also quite nutritious. My favorite way to eat okra is to pickle it. Simply combine equal parts vinegar (any kind works but I like champagne vinegar or apple cider vinegar), water and sugar, in enough quantity to cover the okra in a deep pot. Bring the liquid to a boil, dissolving the sugar; then turn off the heat and add the okra to the pot. Pickled okra. Photo courtesy ArtisanalCheese.com. If necessary, place a bowl on top to keep the okra submerged. 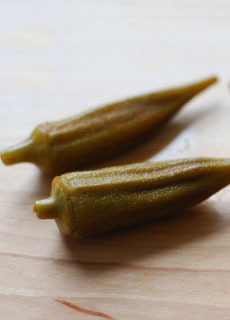 Keep the pickled okra in the fridge in a tightly-capped container; it will last for months. This is the most simple of pickling recipes: You can put anything you want into the pickling liquid, from herbs to dried chilies to fruit. Add your favorite flavors to your pickling brine and turn okra into a food you enjoy regularly. Serve pickled okra on a relish tray, as a garnish for sandwiches and burgers, and anyplace you’d enjoy pickles. Big, juicy peppers are at their sweetest and most flavorful at summer’s peak. The simplest, most delicious way to prepare peppers is to grill them, which couldn’t be easier during barbecue season. Rub peppers with a little oil and throw them anywhere on the grill, turning them regularly to achieve even charring. Once charred, they’re ready to eat and will still have some crunch. If you prefer softer peppers, place them in a bowl wrapped tightly with plastic wrap as soon as you take them off the heat: They will steam themselves to softness in five to ten minutes. You can scrape off the outer skin if you’d like to add the peppers to another dish, like a salad. Otherwise, leave it on for texture and smoky flavor. To take things to the next level, stuff the peppers with anything from seasoned ground beef to goat cheese to ratatouille or bean salad. To ensure food safety, take care to pre-cook proteins; they will reheat inside the peppers. If you find your peppers splitting or bursting, you may want to cut back on your filling, or wrap them in aluminum foil for extra security. Tender and prepared simply, summer squash—yellow squash and zucchini—is indubitably one of my favorite summer produce items. Its versatility is a big part of its appeal: You can roast it, sauté it, blanch it, braise it stew it, grill it, broil it, sear it…and of course, enjoy it raw in salads, as crudités or a garnish—matchsticks atop a chop or filet, for example. Summer squash is well complemented by virtually every herb, spice, sauce and starch in the fridge or pantry. There is very little it won’t pair with, from richer proteins like lamb and steak to more delicate ones like poultry and fish. I find that the easiest way to match summer squash to a protein is in how thick you cut it. With a ribeye, for example, I like to cut zucchini into obliques or wedges and sear them, al dente. With fish, I shave the squash thin on the mandolin. In fact, if you slice summer squash thin enough, you don’t even need to cook it. Just marinate your slices in a solution with an acid, like a simple lime juice vinaigrette, for ten to fifteen minutes. Serve it up spicy, sweet, or savory; summer squash stands up and delivers, and it couldn’t be simpler. If you shop farmers markets in the summertime, you’ve probably tasted some pretty insane tomatoes. They’re one of those foods that tend to literally burst in your mouth with flavor and texture when you bite into them. Their flavors can range from sugary sweet to puckeringly tart, or hit any note in between. When they’re at their best, and you’re lucky enough to find some well cared for heirloom varietals, the dazzling colors and patterns on the surface of their skin can be mesmerizing. But we’ve all had captivating caprese salads and bodacious BLTs; we know what the tomato can do… right? Well don’t get tomato jaded just yet. For your next summer cocktail party, how about serving up some homemade heirloom tomato Bloody Mary martinis? Start by making your own heirloom tomato “water” by puréeing half a dozen tomatoes in the blender and hanging the mixture in cheesecloth over a large bowl, refrigerated, overnight. The next day, heat the liquid to a very low simmer and add whatever you’d like as far as herbs and flavorings. Keep it subtle and be sparing, as you want the tomato flavor to be what shines through. That being said, try throwing in some mint, thyme or sage, and/or some black peppercorns and horseradish root. A drop or two of Worcestershire also wouldn’t hurt. Steep for an hour or so, seasoning slightly but noticeably with kosher salt; then strain and chill. Mix 3 parts chilled tomato water with 2 parts chilled vodka and serve. Garnishes can also keep things fun: a bit of microplaned horseradish or a tiny drop of Worcestershire, a few celery ribbons, a celery stick or fennel stick, a pearl onion, a gherkin or a traditional olive on a cocktail pick. I have saved the best for last. There is absolutely nothing quite like a perfectly ripe and ridiculously juicy stone fruit, be it apricot, cherry, nectarine, peach, plum, plumcot or pluot. Sometimes I feel that I could eat them without stopping: I imagine a never-ending bushel of rosy peaches sitting in a sunny field of clover, reaching in for another and another, taking no heed of the nectar spilling down my cheeks. It’s pure bliss on your taste buds, and it only comes around for a few months a year. 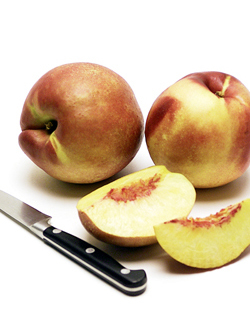 Such perfection, I believe, should not be messed with; I like to eat stone fruit raw whenever possible. Grilled fruit is also delicious; peaches and nectarines are exquisite. Halve and cook them just long enough to mark them. The sweetness comes out with the heat and the earthy char in the markings complements it in the background. Another great way to take advantage of stone fruits is to purée them and turn them into emulsified vinaigrettes (recipe). Purée the fruit with a bit of hot water, just enough to get things spinning smoothly. Then add the acid and seasonings, and finish with oil as you would a conventional vinaigrette. Bright flavors from a dressing like this work for salads and also as meat marinades: Think pork chops!